Heading to safety. Mom (who looks remarkably like our Dolley, don’t you think?) lifts her breat just enough to allow her young ‘uns to scamper underneath. 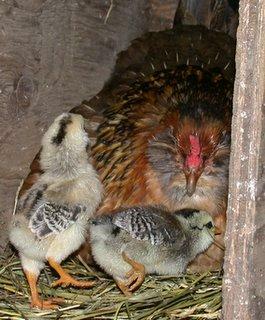 She will ruffle her feathers, sit back down, and all eight or so babies will be kept very warm and safe underneath her.